Look at my page for my TDL! By commissioning, you must agree to the Terms and Conditions! By commissioning me you are agreeing to my rules! Please read everything thoroughly. After I accept, please send the points through my commission widget! Please do not copy, edit, trace, use, or repost without my permission! i'm most likely not going to make a waitlist but ill update the journal when i open again! IF YOU CAN, PLEASE USE THUMBNAILS. It'll be easier for me to see. - Boys and girls are accepted! - I won't draw gore, furry, mecha, bara, manly boy, heavy armor, complicated weapons ;;;. - Currently the only payment method is PayPal. - Commissions are for personal use. If you intend to use it for commercial purposes, prices will differ. not accepting couples at this moment, sorry! drawing will be around 1000x900px and up ! Prices has been raised and updated, i will note the people who are in the waiting lists separately if they still want to be in the list! Added new style options because i developed new styles ;o; ! These prices will be completely stable until i cleared out this list! - You can either comment or send me a note to be added on the waitlist! - If you do not reply to my note after a week you will be removed from the waitlist. - No trolling or you'll be blocked. - I will not draw anything that would require a mature content warning. - I do not draw furries or mecha. - I can draw from text descriptions of characters. I accept points and paypal ! please read terms of service before ordering !! I only accept PayPal. No points or otherwise. No gifting your slot away if I don't permit it first. No re-selling your slot under any circumstances. - Paypal: I only accept payment using Paypal invoice which will be sent within 24hrs after confirmation. - DA pts: Please pay through the commission widget. - This is for personal use only. For commercial commissions, send me a note or add me on discord (kirankira#1720) so that we can discuss! - After I accept your order, you should send me the payment as soon as possible. - Full-sized picture with *.PNG format, uploaded to my sta.sh. This animation is completely original! I'll draw your character based on his biography. 5/11/18: Commissions are open again! Only halfbodies are available this batch, please be aware of that! edit: after some quick thought I will open other types except chibis up too! Will focus on finishing current batch now! FORMCommission type : mini chibis, chibis, icons, etc. 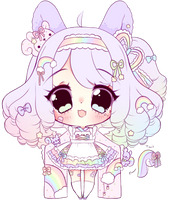 Character ref(s) : Clear , fullbody & colored please. Personality : cheerful or tsundere , etc. Other : example - don't forget her eye patch, etc. Please tell me before if you'd like me to add the character's specie (optional) to put in description later! Payment via PayPal and please pay within 48 hours after I confirmed your order. No refundsCommissions are for personal use only, contact me via note/email for commercial commission. Please only commission me if you're serious with it ! Thank you so much for reading and for your interest in my art.